We spent Sunday afternoon on a lovely nature walk in the Sheldon Marsh State Nature Preserve outside Huron, Ohio. Public access is along a paved drive flanked by woodland paths that heads straight out into Sandusky Bay. It’s a prime birdwatching spot in the spring and autumn: birds use it for rest and refueling for the hop across Lake Erie between the US and Canada. The wetlands also provide habitat for longer-term residents making the preserve an excellent place for nature-loving hikers all year ’round. 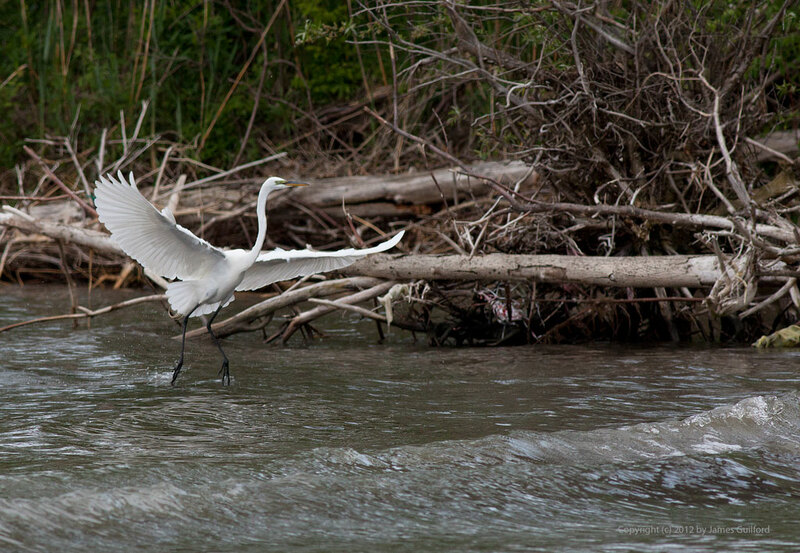 Great Egret comes in for a landing. Along the way we discovered and usually photographed many scenes, both still-life and wildlife, including ducks, a Baltimore Oriole, squirrels, chipmunks, turtles, snakes, and a Great Egret (Ardea alba). The egret was hunting in the shallows of the preserve’s beach area, along a wooded shore. The big bird knew where to find fish and I watched as, in rapid succession, it caught and quickly swallowed two. At some point it decided to move closer to shore and that’s when I got a few images of the egret in flight. A Redwinged Blackbird eyes the photographer warily. Redwinged Blackbirds (Agelaius phoeniceus) have marked my springs and, especially, summers for as long as I can remember. 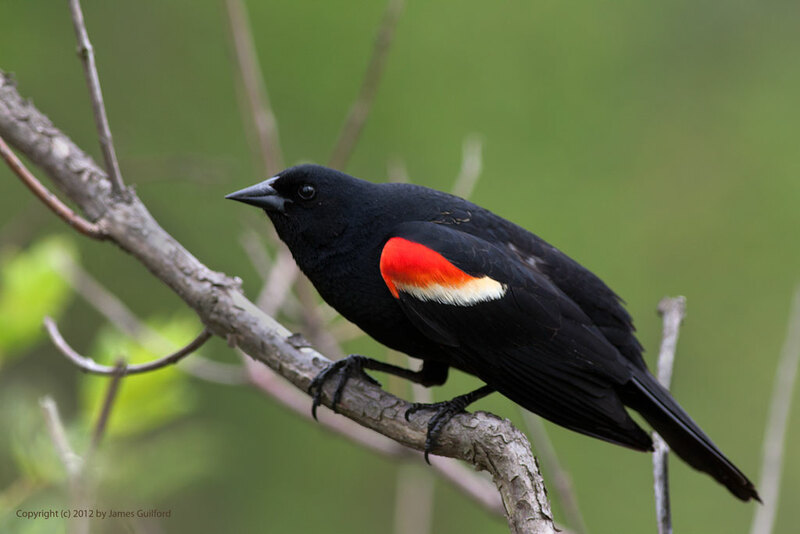 Their jet-black plumage accented with large red shoulder spots, their aggressive nature and raucous calls, make for an interesting bird to watch and listen to. There were many redwings in the preserve, darting in and out of the wetlands’ tall reeds — presumably nesting there. Occasionally there were territorial disputes, raucous and aggressive as would be expected. I spotted one bird picking at seed dropped by a visitor on the walkway. As I drew closer, the bird popped up into a neighboring tree. The redwing warily watched as I came a bit closer and shot a few photos of it perched on a branch. I stayed a bit too long so Mr. Redwing flitted into the woods. 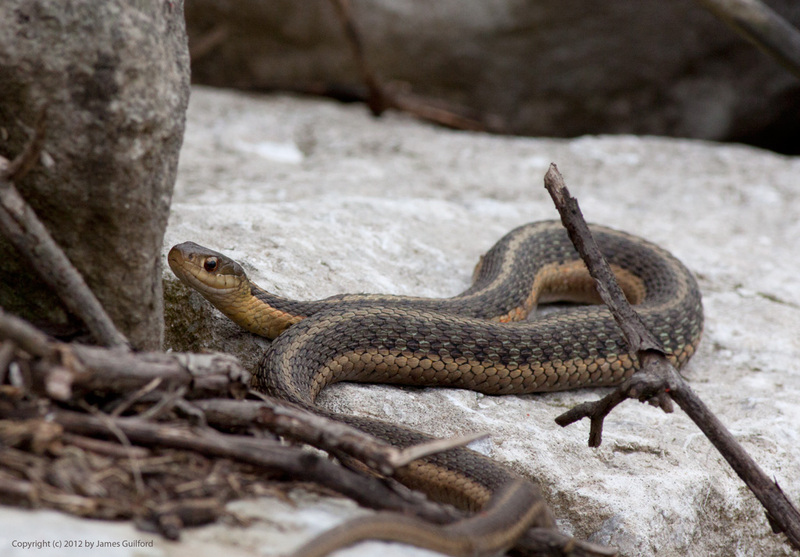 A Garter Snake warms itself on a rock of its breakwall shelter. I had been looking around mostly at birds and (wet)landscapes and hadn’t really noticed but we were, it seems, surrounded by snakes! An enthusiast, accompanied by his family, was spotting snakes sunning themselves among the rocks of a breakwall. He would hop on to the stones and deftly grab resting snakes! At first I worried he might do the reptiles some harm but he seemed mostly out to admire them, maybe prove his courage and skill, and then safely release. Once cued in, we began seeing the snakes. We spotted and photographed a Northern Water Snake (Nerodia sipedon) apparently ready to molt and, later, a Garter Snake (Thamnophis sirtalis) along the breakwall. We had a fine, relaxed time enjoying nature, a lovely day, and a walk at the marsh.